Isolation is the prominent theme in episode five of "Tunnel - Drama" and the series uses it to reveal its cards about some topics which have been teased. Seon-jae's identity is provided and we now see his issues clearly. While investigating a case cut off from the world, our characters have to deal with some of their own demons and approach the hidden culprit not only with evidence, but their own humanity in mind. Nothing makes me happier when watching a fictional work than feeling that I am being treated as an intelligent person. It is not very easy to enjoy or feel invested in a story when being taken for an idiot who cannot rub two sticks together by the writing. "Tunnel - Drama" manipulates viewers in interesting ways and then pays us back by providing food for thought. Seon-jae (Yoon Hyun-min) is a good example of that and it ties in with this episode's subject. While the drama has handled victims well so far, I was wondering if the nuances of guilt would be explored as well. Jae-i's (Lee Yoo-young) obsession with criminals was my best bet, but I am glad to see the episode try different approaches. Stirring up the audience's lust for catharsis by portraying remorseless villains is easy drama, but asking the hard questions that may often lack answers at the possible expense of that visceral satisfaction is tough. Trusting viewers to be patient and to embrace being challenged is tough. "Tunnel - Drama" does that. This is where the aforementioned isolation comes in. Seon-jae has been painted as a boring character and this makes the revelation of the reasons why and the story behind them even more impactful. Seon-jae's identity was a shock for me when a viewer pointed it out in my previous episode review and his current focus is another pleasant surprise. He, Jae-i and the culprit show us the more indirect ways in which victims suffer and in which criminals are made. Aside from the spacial isolation of the case taking place in a blocked off area, the episode portrays the pitfalls of keeping one's pain locked in and the people willing to help locked out. It also questions the moral weight of different crimes and different criminals through its portrayal of someone who went from a victim to a culprit. How do we handle the reality of people not being nasty caricatures? 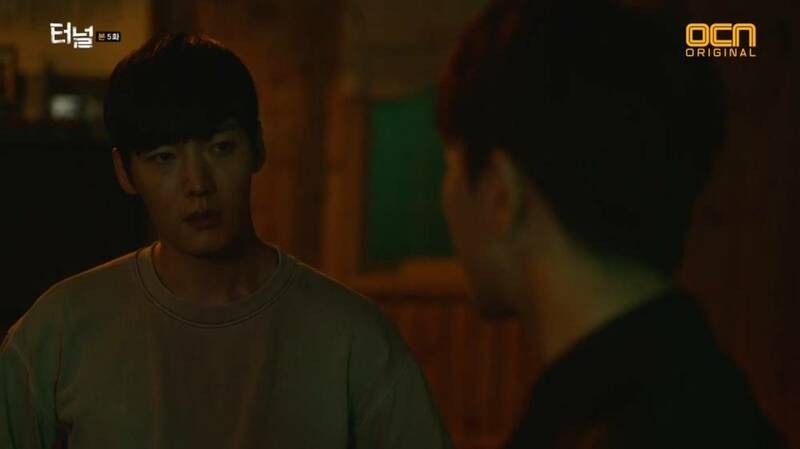 This incident also brings Seon-jae closer to Gwang-ho (Choi Jin-hyuk) and Jae-i. Aside from human connection, the latter introduces romantic attraction. I hope my suspicion that she is related to a criminal is right, as it would carry the topics already presented further. I know that this review has not addressed the plot, but I feel I would be doing the episode's special charm a disservice. I hope to cover all the new developments soon. "Tunnel - Drama" is directed by Sin Yong-hwi and Kim Seong-min-I, written by Lee Eun-mi-III and features Choi Jin-hyuk, Yoon Hyun-min and Lee Yoo-young.